Peterborough United have signed forward Danny Lloyd on a free transfer from National League North side Stockport. The 25-year-old former AFC Fylde player has scored 29 goals and assisted 19 this season and moves to the League One club on a three-year deal. Lloyd has been working for a waste disposal company alongside football. "I believe in my ability and believe this is a level I should be playing at. I wish it was 1 July already," he told BBC Radio Cambridgeshire. 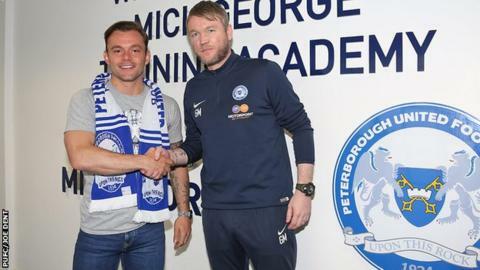 "To be brutally honest it was a very easy decision to join Peterborough. Once I spoke with the gaffer about the way he wants to play, it's very similar to what I've been playing. "I think I'll fit in really well and he thinks I'll fit in really well. Everyone knows Peterborough United's track record and what they've done for lads from non-league. "First and foremost, this season's about working hard for the club and if the club do well, the lads will do well." Lloyd is Posh's second signing of the summer, and the second from non-league after the arrival of Ricky Miller from National League side Dover.